Where is the water? If there’s going to be Sandhill Cranes there has to be water. Let’s be honest, Arizona is pretty dry. So when I heard some birders talking to Steve the day before about the thousands of Sandhill Cranes at Whitewater Draw I was not expecting a drive out into what I thought was the middle of nowhere. And I was expecting to see water at any time, but I had to wait. I look really patient in this photo, right? 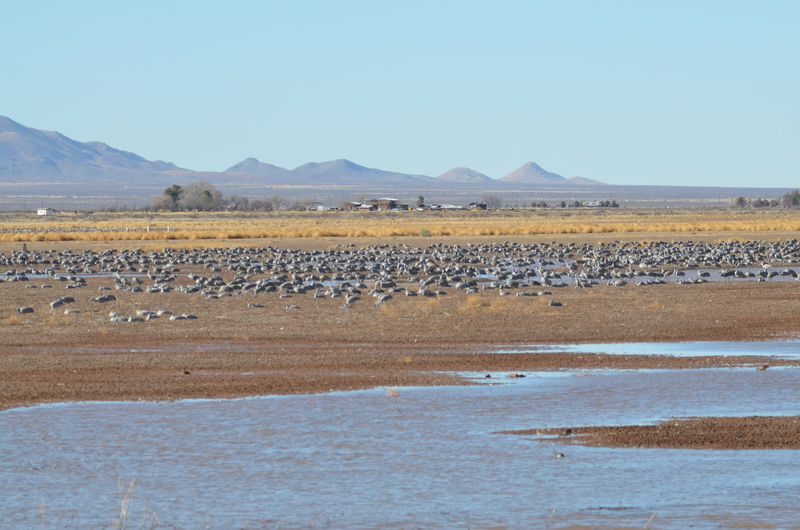 After our morning birding at Patagonia Lake State Park, we drove through the town of Tombstone via Highway 89 and turned east on Davis Road then to Coffman Road in search of the Sandhill Cranes. I realized that once I started to see agricultural fields I knew water had to be around somewhere. There had to be a way to irrigate. 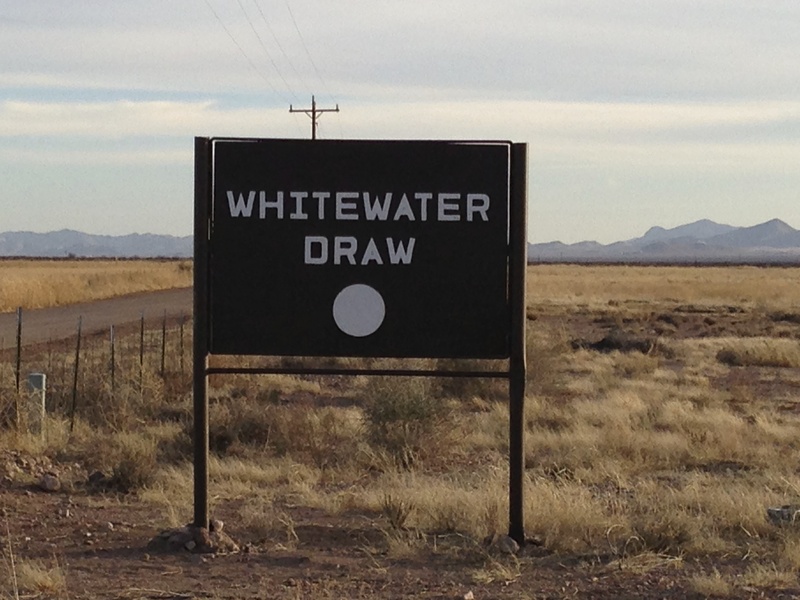 We were only about 100 miles from Tucson and then we found it: Whitewater Draw. This area in Southeast Arizona is very unassuming, and if you weren’t looking specifically for it you’d easily miss it. The 1400-acre site has a pond that varies with the runoff and it’s almost shocking to see a pond clear in the middle of this dry Arizona. I think I’ve decided that I love water birds: shore birds, rails, waders, ducks. I loved Bosque del Apache in New Mexico, I love Antelope Island, of course, and Bear River NWR, both in Utah, and I adored Crooked Tree in Belize. Perhaps it’s because I can see a variety of species in one place. Or maybe it’s because they sit still and don’t really hide much (unlike warblers, sparrows, or other song birds). But I actually think it’s more than that. Generally these places are a refuge—a resting place. There’s something very cathartic about it, watching birds feed and get ready to journey on to their next destination. Water is always relaxing, there’s generally great landscape around, and with a lot of birds there’s always drama going on. You don’t have to look very far to find it. The big news story this day at Whitewater Draw were the thousands and thousands of Sandhill Cranes. Never in my life had I seen so many Sandhill Cranes. They preened, they called to one another with their deep rolling trumpet and rattling, they walked around. They were totally at peace and so was I.
I took gobs of photos of the Sandhill Cranes, but I was struggling with my new lens and teleconverter. I simply could not get a sharp photo. 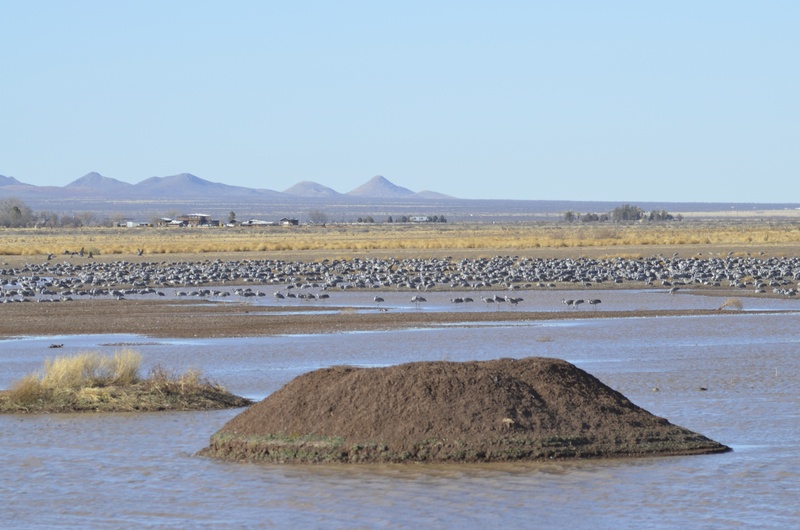 Bad photography notwithstanding, I could sit there all day on one of the benches and just look out at the multitude of Sandhill Cranes with their calling and trumpeting. We stood out on platform over the pond for quite some time. 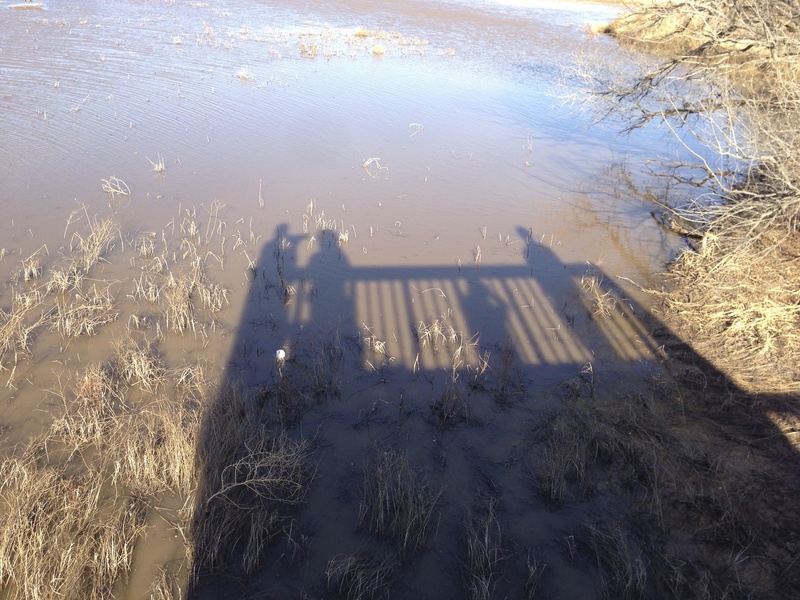 A group of 50-something-year-old Harley Davidson riders leaned over the railing of the platform, looking at the Sandhill cranes and variety of ducks, commenting on each of the species. 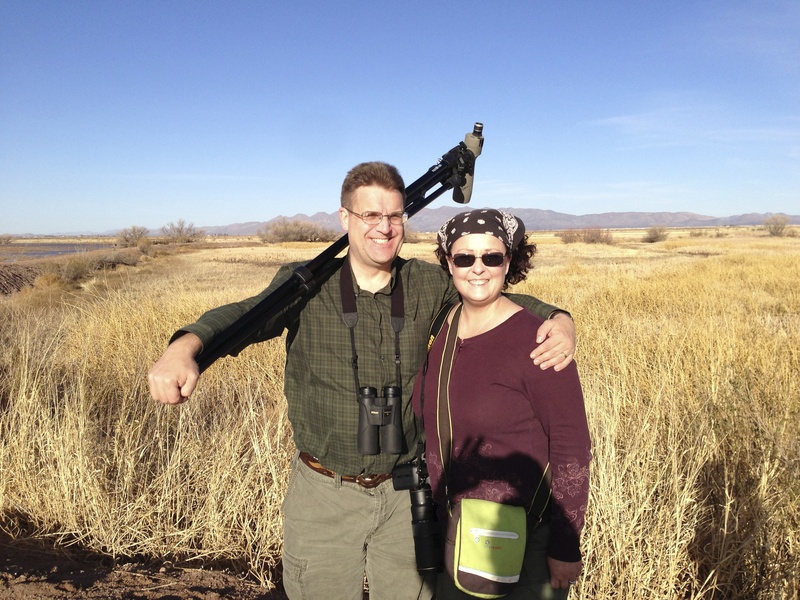 Why, they’re birders! I realized. As we wandered toward the willow thicket toward the southeast corner of the ponds I found two lifers I wasn’t expecting: The Sora, a rail that’s likely migrating through, and the Long-eared Owl. Not a great photo of the Sora, but a photo nonetheless. Not the best photo, but you can see the Snow Geese mixed in here. Very cool, my hubby is in Tucson right now……….. I will forward your blog post to him! Wow! The Draw is such a sweet place. 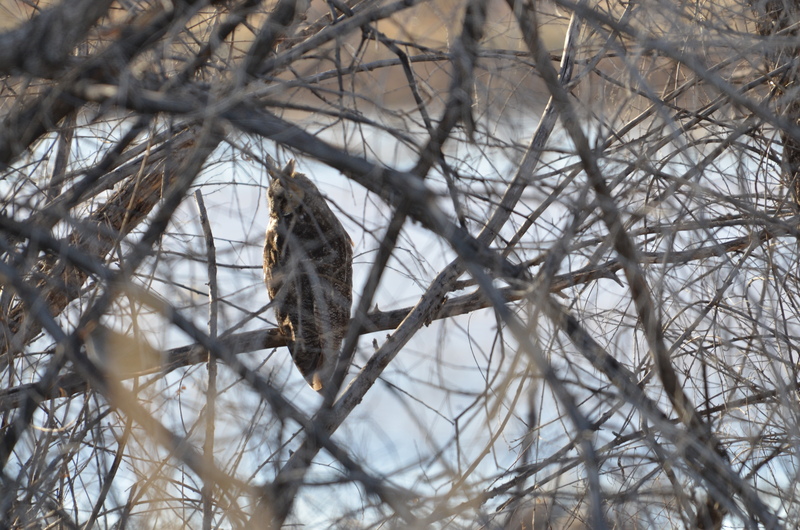 It’s great you got Long-eared Owl too! You’ve got an AZ lifer that’s still eluding me, arrgh!! Super cool stuff. Great post! Your post and pictures make me want to hop in the car and head down to AZ (from NJ!) to do some birding! Arizona is very tempting, isn’t it? Especially with this horrible winter we’ve all had. Someday I’ll have to do some birding in NJ. Also, glad to have you following along. We leave in less than two weeks for a big Ecuador birding adventure! I’ll be posting a lot. 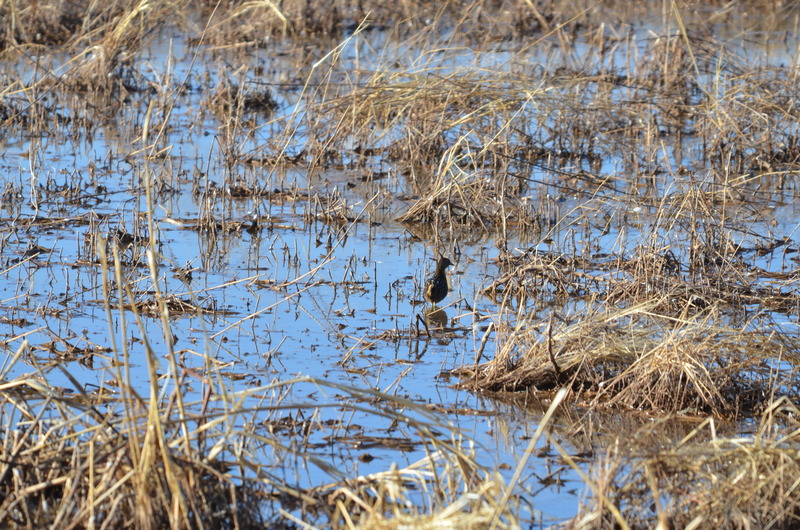 I love water birds, too….especially the rails and shorebirds. The Sora is one of my nemesis birds; I often hear them, but rarely see them. My lifer Sora was actually a little black chick at the edge of a mud flat; since then I have only seen one adult. I can’t wait for our snow to melt and our water birds to come back! I’m so excited for Spring migration too! And stay tuned…I’ll be leaving for Ecuador soon with more bird reports. Wow, Ecuador…looking forward to reading about your adventures!